Good Eats & Sweaty Runs | Run, Lindsay, Run! Wow, you really made the most of Restaurant Week! I always wanted to take part, and this time I finally did – Ponte’s in Tribeca last week was pretty good, but Ilili in Flatiron last night blew me away! Your review makes me want to try Hurricane Club. Way to tough it out in this weather! I totally forgot it was restaurant week! Darn it. I’ve wanted to go to blue water grill for a while. I made it out today for a very hot and sweaty 10 miles in central park. It was tough but I was glad I went. I’ve done restaurant week a few time but have yet to hit it up this year! 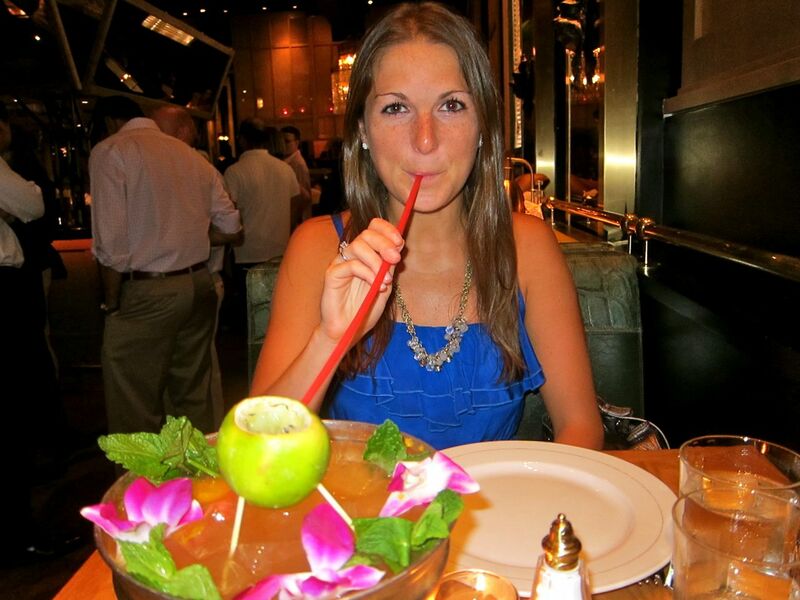 I went to Mr. Chow one year – it was FANTASTIC! I ran 13 today and my friend and I ran slow and took a water break about every 2 miles. At the half way point we were both getting really hot so at our water stop we also just let ourselves cool off a bit by the breeze, which was much needed. We did that at each water stop for the second half. This heat has actually been really tough on my running, which is weird because it NEVER bothered me in the past with tennis or last summer running. I’m not sure what it is but I find myself getting very nauseous a lot. Today, I started getting chills and cramps from water, which sucked. I felt pretty awful – when we got back to my friend’s apt I downed a banana, a bunch of tortilla chips, and a coconut water. And then felt much better. So, I guess I need to work on my electrolyte intake when running. I need to find gatorade without the sugary high which makes me sick! Ok, sorry for this novel. I can’t believe I’m saying this, but I think I’m getting used to the Houston heat when it comes to shorter, early morning runs (long weekend runs are a different story. My speed has increased considerably and my splits are much more consistent. Bring it, NYC Marathon! My best Restaurant Week experience was in Summer 2009. My sister and I went to the Red Eye Grill in Midtown West. I had a yellowfin tuna burger with parsnip chips. Amazing! I’m so jealous of all your restaurant week dinners! I haven’t taken advantage this year and I’m so mad! All of those choices look great – I hope they extend restaurant week so I can get in on the action. This week has been the worst! But you’re right – getting out there and getting it done is important. Normal temps will feel so glorious compared to this week! i love restaurant week, and usually make all of them. this was the first one that i didn’t take advantage of in a while! i’ve gone to some good ones, but rouge tomate was a favorite. as for the heatpocalypse (btw, so hard to believe that a few short months ago we had a snowpocalypse), i’ve been finding places to spend my days so i don’t have to use my own air conditioning. so excited for tomorrow’s practically balmy 92, haha. Hurrican Club looks snazz! Love the run-down, nice job for hitting up all these spots! This heat really is crazy…I got a late start on Saturday and ran with it was 102, so I cut my long run down to eight miles and kept the pace on the slower side. It really wasn’t as bad as I thought it was going to be, but I’ve never been so drenched in my life! I love my AC more than ever right now.